The Cobblers will again be without central defenders Ash Taylor and Leon Barnett for Tuesday night’s Checkatrade Trophy group stage clash at Oxford United (ko 7.45pm). The news means the Town boss’s options for any chance in defence are severely limited, and he also wouldn’t be drawn on whether or not he would be rotating his team for the game. Checkatrade Trophy matches are used by the majority of managers to give squad players who perhaps haven’t been overly involved some minutes out on the pitch. But with Curle just one week and two games into his stint as the Town boss, it could be he decides to go for continuity and makes minimal changes as he tries to get the team playing the way he wants them to. “Ultimately we want to win games, we need to win games, and that is what we are working towards,” said Curle, who is also set to be without striker Junior Morias, as he has yet to recover from his hamstring strain. “We are still in the process of laying foundations and benchmarks, putting the pillars in place of what we are trying to do. “We are exploring what is in the changing room. “I know their names, and I know their characteristics, but I still don’t fully know how they react to putting them under the spotlight and the demands that I want from within the team framework. “There are still players in the squad that haven’t been given the opportunity yet, but whether it’s a cup competition or a league game, I don’t give shirts away cheaply. “If a player gets a shirt it is because he has earned it, and for varying reasons, whether it be the availability of other players, fitting into the team selection, or whether it is just the opportunity for me to have a look at what is in the squad. 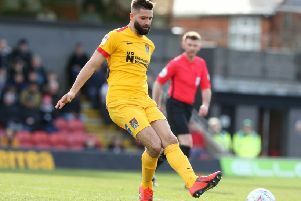 The Cobblers need at the very least need to draw and claim the penalty shootout bonus point from Tuesday night’s game if they are to keep alive their hopes of reaching the knockout stage of the Checkatrade Trophy. As is stands, Town have played one and lost to Wycombe, who sit top of the Southern Group F pile as they have also beaten Fulham Under-21s and have six points in the bag. Oxford also saw off Fulham’s youngsters in their other group game, meaning Town have to claim at least two points from the Kassam to stay within touching distance of their hosts and stay alive in the tournament. Karl Robinson’s side dropped to the bottom of league one on Saturday.